MS Sathyu's 1974 movie on the post-partition era was re-released on November 14 after digital restoration. Last Saturday, I chose to watch the 40 year old movie over other options like Interstellar, Gone Girl and Kill Dill and I don't regret a bit. In fact, before writing anything else, I must thank PVR cinemas for running the movie and giving the audience a chance to view one of the rarest jewels in the history of Indian Cinema. Garm Hava is a BEAUTIFUL movie indeed.When I moved out of the hall it felt as if I had walked out after living the history of India for 146 minutes. The feelings were mixed - that of empathy, patriotism, pain, brotherhood and joy. But above all, there was a feeling of immense respect for the makers of this movie. The movie is a story of a the travails of a Muslim family that chose to stay in India after partition. Based on Ismat Chughtai's unpublished story, it is a heartwarming tale of lost love, of broken trust on one hand and of strong faith in the secular fiber that India is made up of on the other hand. The movie stands tall on four pillars - Kaifi Azmi and Shama Zaidi's screenplay, Balraj Sahni's marvelous acting, Gita Shauhat's portrayal of Aamina's character and MS Sathyu's attention to detail. Making a movie based on Partition has never been easy. Think of any movie based on the subject and you will remember it ran through some controversy or the other either before or after the release. MS Sathyu's conviction towards the movie however deserves a special applause - making a movie on the subject when the wounds were still fresh was not an easy job - he survived protests and bans to present to India a touching chapter from its history. A chapter that is generally intentionally skipped by many of those who, for their own mean reasons, wish to present a distorted version of history. It is ironical that most movies that I believe have the ability to promote communal empathy have been termed as "controversial releases" for the fear that these would instigate communal discord. This is what exemplifies difference in perception I guess. 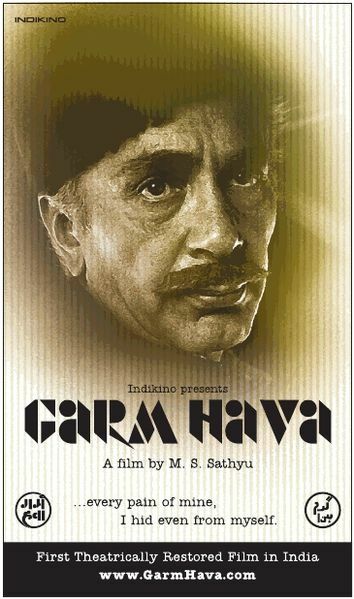 Garm Hava too was banned for the same reasons but when it was released it went as to win an award for National Integration. As they say, good work always pays, sooner or later. When I recommend you to watch the movie today, its not because you as an audience deserve to watch a good movie but because this movie deserves a tribute from all those who believe in a secular India. For those of you not moved by my emotional urge, here are a few other facts that make this movie special: this movie is the first few movies on partition, it was Farooq Sheikh's debut and veteran Balraj Sahni's last. It is an Oscar-Nominated movie! Convinced enough? Go and watch this movie now, if it is still playing at at a PVR around you. Else here is a YouTube link - the print may not be fine but the movie is one of the finest movies you will watch.